Whether it’s bowling or fetch, bunnies love to play. As your rabbit’s unique personality unfolds, you’ll come to find out what sorts of activities your bunny likes best. Here are some games to play with your pet rabbit. Rabbits enjoy games that cater to their natural tendencies. 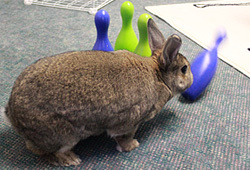 A game of bunny bowling will appeal to their mischievous side, as they delight in knocking things over. Set up toy bowling pins and watch as your rabbit nose-bonks them all down. On a similar note, rabbits love to steal important papers (or apples you’re eating) out of your hand and run away with them, most likely binkying along the way. Admittedly, this is not exactly a game… or at least not one in which you’re a willing participant. But your bunny will certainly be amused. You can also play a game of “fetch” with your bunny… except you’re the retriever and your rabbit is the one doing the throwing. Some bunnies like picking up toys with their teeth and tossing them with a flick of their head. Toys for birds are great for this activity because they can easily grip them. You can also go a less expensive route and provide cardboard tubes from paper towel or toilet paper rolls. Stuff those tubes with hay to spike their interest further. When you are away from home, your bunny still needs to play, so it is a good idea to have a selection of toys available. One bunny favorite is a cardboard castle. 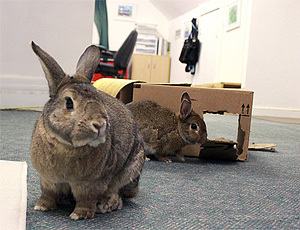 (See our article on Building a Cardboard Castle for your Bunny.) Rabbits love to dash in and out of the doorways and make renovations by chewing on the walls and scratching at the floors. For diggers and burrowers, provide straw mats, boxes full of paper shreds, and cardboard tunnels. For more information, see Enrichment for Your Pet Bunny and How to Deal with Chewing & Digging. Other toys can include untreated wood products, hard plastic baby toys, plastic balls with bells inside, pine cones, oatmeal boxes, and phone books. A note of caution: some types of wood can be poisonous for rabbits, such as cherry, redwood and peach. As naturally smart and curious animals, rabbits also enjoy being challenged with logic toys. These are toys where the rabbit needs to figure out how to open a box, pull a lever, etc. in order to get a treat. For more information, see our article, Logic Toys for Rabbits. There are many benefits to playtime with your pet bunny. Not only does it help build a bond between you and your pet, it also provides your rabbit with much needed mental stimulation and exercise. P.A. Smith and Abi Cushman are the proud owners of two mischievous agouti rabbits named Coco and Cosette. They also co-edit the fun wildlife website called Animal Fact Guide. Like this article? Please share it! Help! My Rabbit Hates Me! ZOOOOOOOM!!! Aviator Bunny soars through the sky in this adorable print. Perfect for a child's bedroom / nursery or for bunny lovers of all ages. Yesterday’s News is a recycled paper pellet litter that absorbs the smell of rabbit urine. Put a thin layer on the bottom of the litterbox, then fresh hay on top. No more smell! My House Rabbit is an educational website that promotes keeping pet rabbits inside the home. The site was founded by veteran rabbit owners Abi Cushman and P.A. Smith of New London, CT, who currently share their home with two mischievous agouti rabbits named Coco and Cosette.